(16/49) TRENTON – New Jersey residents and visitors are encouraged to take advantage of the state’s splendid scenery and great trails by participating in a variety of recreational activities in conjunction with the 24th Annual National Trails Day to be celebrated statewide and nationally Saturday, June 4. From hiking and cycling, to horseback riding and kayaking, to nature watching and taking part in trail maintenance projects, residents are encouraged to get outdoors and connect with nature, even if only for part of the day. An initiative of the American Hiking Society, National Trails Day was first celebrated in the United States in 1993 to commemorate the 25th anniversary of the National Trails System Act. 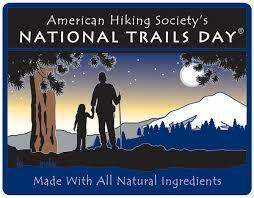 It is now an annual event designed to promote the many attributes of recreational trails. Last year, National Trails Day participants across the country hiked 354,000 miles – equivalent to 14 times around the earth, according to the American Hiking Society. They also biked 123,000 miles, paddled 14,000 miles, and rode 36,000 miles on horseback. 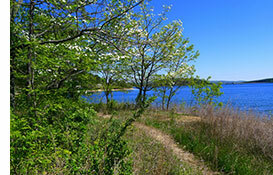 In addition, 24,700 volunteers built and maintained 1,500 miles of trails. National Trails Day develops a public understanding of the importance of recreational trails and the efforts needed to establish, preserve and maintain them. Trails provide health and fitness opportunities, outdoor classrooms to study nature, greenways for wildlife conservation, links to history and regional tourism opportunities.